Hard to believe that we're about to wrap up the first year of a 2-year MFA degree! To cap off our trimester and celebrate the end of Year 1 there will be an Interim Exhibition that coincides with the Degree Show for graduates. 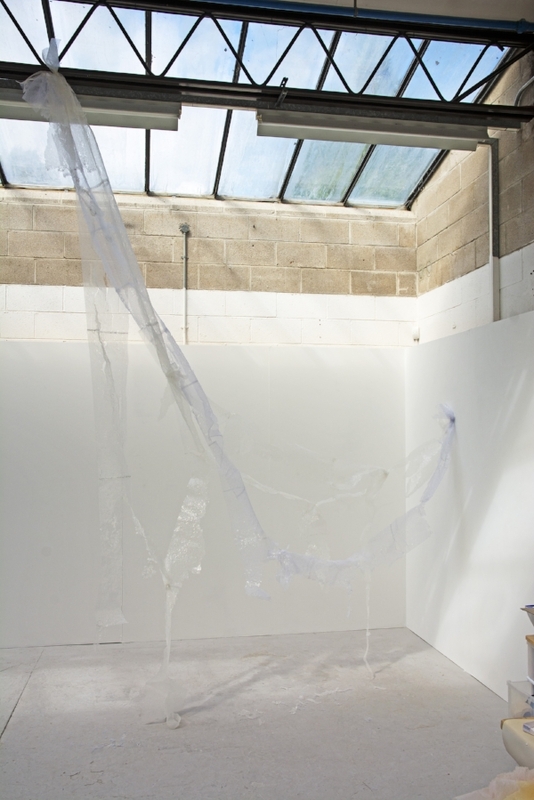 The Interim Show runs 21 - 26 September, with a Private View on Thursday, 20 September 6-9pm. After a truly wonderful summer spread out in the spacious studios on the main campus, we'll be tucked back into our regular studios at the Dartmouth Avenue satellite campus for this show, giving us a running start into Year 2 come late September. A number of students were interviewed about their research by the University's PR team in preparation for the shows. Read on to learn a bit more about the state of my emerging practice as this first year draws to an end. Kelly M. O'Brien, Tricky Balance. Paper, tulle, thread, steel, wood, rock, cast lead. 154x160x35 cm | 60x63x14 inches. ©2018. My current research is focused on how specific factors such as materials, form, texture, and color combine and interact to create a narrative related to themes of home, dislocation, belonging, and loss. The materials I use pierced paper, thread, shredded tulle are purposefully delicate, ephemeral, and unstable. I am learning that they are stronger and more resilient than you might think, an apt metaphor for my themes of interest. Mixed media sculpture. I have been testing the limits of material and form how opposites such as strength and delicacy, impermanence and stability, accretion and disintegration come together and fall apart and how these paradoxes might be expressed through mixed media sculpture. Kelly M. O'Brien, Shattered (resilient). Acetate, thread, pins. 380x300x40 cm | 150x118x16 inches. ©2018. At this stage of my MA research, I am learning how materials perform. Contingency, failure, and repair are central to this process. Given that I use mainly pierced paper and thread, the solutions can only be discovered as materials tear or fall apart, and are mended, weighted or reinforced. By experimenting with combinations of materials, objects, and images I hope to understand how narrative develops. Each sculpture starts with a basic form in mind that requires me to find solutions related to balance and material strength under tension. If a piece is working, the story unfolds. It's as if the work guides me on how to make it, not the other way around. I'm learning to let go of preconceived ideas and see what happens. Kelly M. O'Brien, Shattered (resilient), detail. Acetate, thread, pins. 380x300x40 cm | 150x118x16 inches. ©2018. What motivates you to create your work? While my themes of interest are based on my own story of an American living in the UK - a home that is not my homeland - this narrative is increasingly universal. In a world where refugees are routinely turned away and nations draw inward, my experience is in stark contrast to those with far less privilege. The MA research is helping me develop a visual language that allows a narrative to be accessible to the viewer. My interest is in creating work that fosters personal reflection as a portal into broader contemporary issues. If we see ourselves in the story, there's room for connection and empathy. Kelly M. O'Brien, She Holds Tight (detail). Paper, tulle, thread, steel, cast cement. 275x280x65 cm | 108x110x25 inches. ©2018.